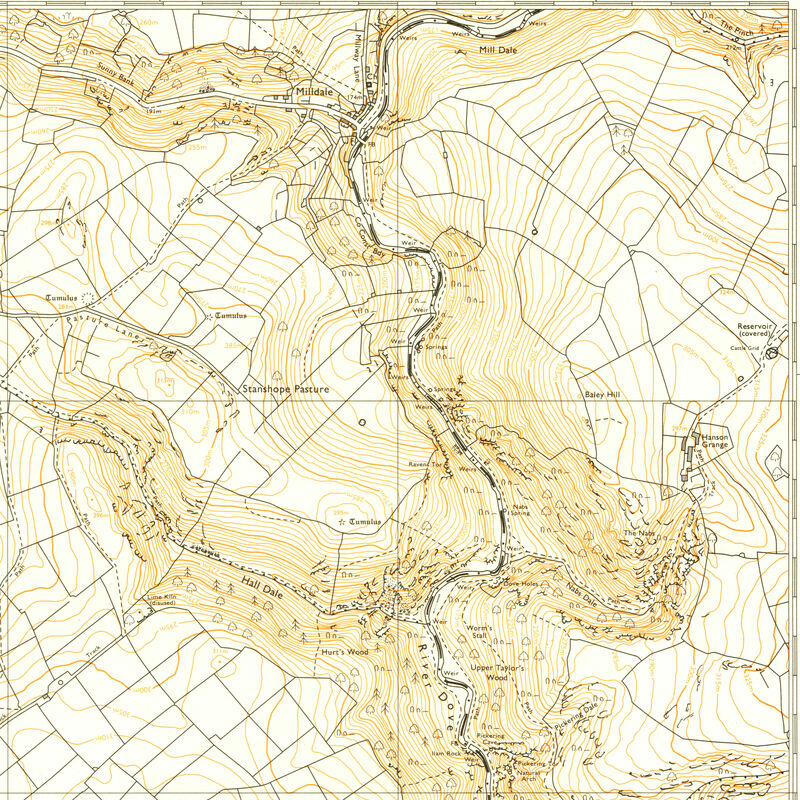 The 1:10 000 Ordnance Survey map sheet SK 15 SW shows the Derbyshire-Staffordshire border running through Dovedale. 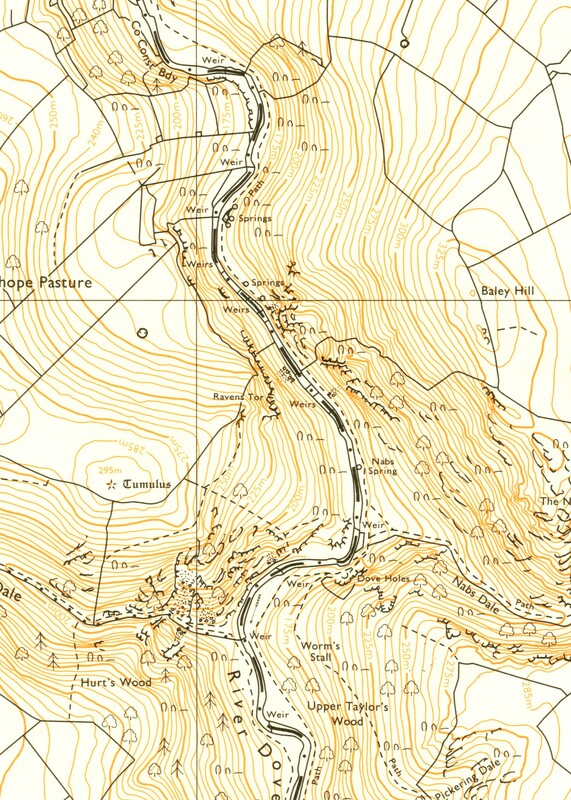 The version of the map shown here is from 1978; the sheet as a whole is centred on Ilam, extending from Milldale in the northeast to Calton in the southwest. Although this an example of a mass produced, functional map, scrutiny of it advanced our understanding of groundwater spring flows in the River Dove. Often, maps of this age might be overlooked and even dismissed as out of date, but the 1978 map provided valuable information not present on more recent versions. In addition, working with the map made me aware that I used the paper copy differently to online equivalents, which I mine for specific information, often missing the broader map context. In contrast, I browsed this paper map, and in the process found evidence of spring flows along the River Dove. Water temperature is a key determinate of ecological health in rivers and, therefore, monitoring the changing temperature of freshwater bodies is critical to their management. In the Rivers Dove and Manifold in the Peak District, UK, we have been monitoring the water temperature with sensors installed in the river bed since 2010. The dataset has provided a fascinating insight into temperature dynamics in rivers and, in particular, the spatial and temporal heterogeneity of this important parameter. There are expected trends; for example, water temperature should gradually increase with distance downstream as the time water is exposed to the sun increases. It was therefore surprising to find that on the River Dove the temperature changes dramatically over short distances, in some places dropping 10 °C in a few hundred metres. The River Dove is geologically complex, sitting at the interface between Limestone and Millstone Grit. Therefore, we expected groundwater inputs to drive these thermal changes. An initial look at contemporary Ordnance Survey maps gave no clues as to the source of the groundwater so we explored in the field. Over three years we mapped out 35 surface spring flows, 30 of which were in Dovedale, some shown on the accompanying photographs. Some of these features were large, over 5 metres wide and considerably increasing the discharge of the river. We also identified interesting hydrological features such as a semi-thermal spring near Beresford Dale, which is always 14 °C. 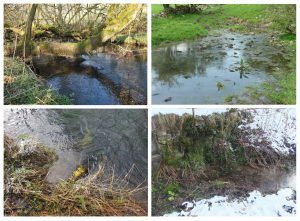 Images of springs on the River Dove at, going clockwise from top left, Ludwell, Sprink, Big Drop (also known as “Nabs Spring”) and Yellow Pipe. We named these springs during our surveys; for example, “Cave Spring” and “Big Drop” were large springs in Dovedale and “Yellow Pipe” spring has been unceremoniously channelled through a yellow pipe under the footpath. 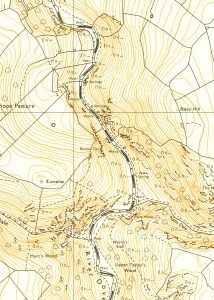 The mapping of these features aided our interpretation of the data; however, a chance look at the 1:10,000 Ordnance Survey map of the area from 1978, brought a revelation. Many of the springs had been marked on these earlier maps and were clearly highlighted, as shown on the detail below. Indeed, some even had names such as “Nabs Spring” which we had named “Big Drop”, which now ungraciously leaks through a brick wall. Renewed interest in this historic mapping of the area also led to other clues to the significance of the groundwater inputs. One of the biggest springs is next to a farm house, which on the map is called “Sprink”, presumably a derivation of the word spring for which the house is named. More sleuthing revealed that a large spring observed at Ludwell was also responsible for the place name with “Hlud” meaning loud and “Well” meaning spring – a Loud Spring, something still true today. A cropped version of the map showing Nabs Springs. Click to enlarge the image. The combination of our monitoring data, field observations and analysis of historic mapping has identified the importance of groundwater flows to the River Dove and, whilst many are now hidden in the landscape, it is clear in the past that springs were seen as key features, worthy of naming. Whilst other documentary sources of the springs have since been found, it was browsing this humble, mass produced paper map that sparked our interest, and broadened our understanding of the significance of spring flows on the River Dove.